Go to the calendar in your Veracross portal and choose the subscribe tab. 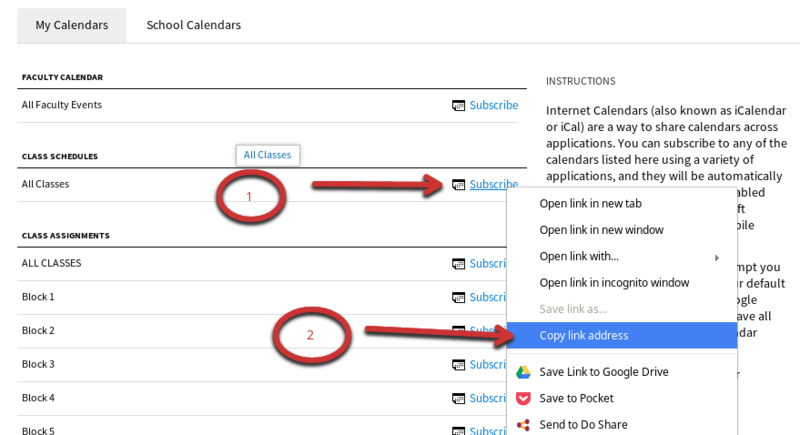 On the calendar listing, RIGHT-CLICK the “All Classes” Subscribe link and choose COPY LINK ADDRESS. The next two steps are the most important steps of this process. You now need to change the text that reads webcal to http, keeping all the other text unchanged, and hit the enter key. After you edit the text and hit enter, your browser will download a file to your computer. That file contains your class schedule that you will import into your Google calendar. Open your Google calendar. Next to the Other calendars text there is a small arrow you should click that will open a menu of options. Choose the IMPORT CALENDAR option. After you choose the import calendar option, a dialog box will open asking you to choose the file you want to import. You will upload the file you downloaded in Step 3. After you select your file and it is listed in the import box, you will click IMPORT to bring your schedule into your Google calendar. 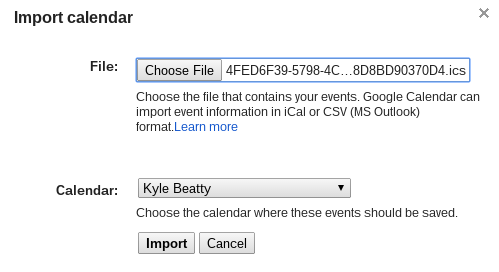 That is all it takes to import your schedule into your Google calendar. 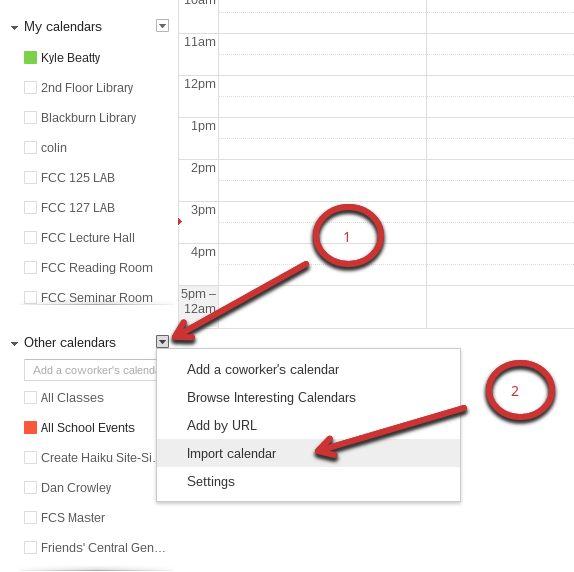 Now if your peers did the same import into their calendars, you would be able to see if they were busy or free when trying to schedule an event with them through Google calendar. There is one caveat for Upper School to notice after you import your schedule. Because of the alternating block schedule and lunch isn’t actually scheduled, classes that happen between 12:40pm and 1:55pm will show as a double block. The classes that start at 12:40pm will show as ending at 1:55pm even though it actually ends at 1:20pm.